We were really looking forward to Fran & Sue’s visit as their previous workshops with us had been such fun to do. Their wish list included glass fusing, more riveting, a taster session in enameling and lot and lots more ! Clicking on the photo above should take you into the album on our FaceBook page which shows each piece in all its glory ! I thought I would show you just a few of the pieces and how they were made. 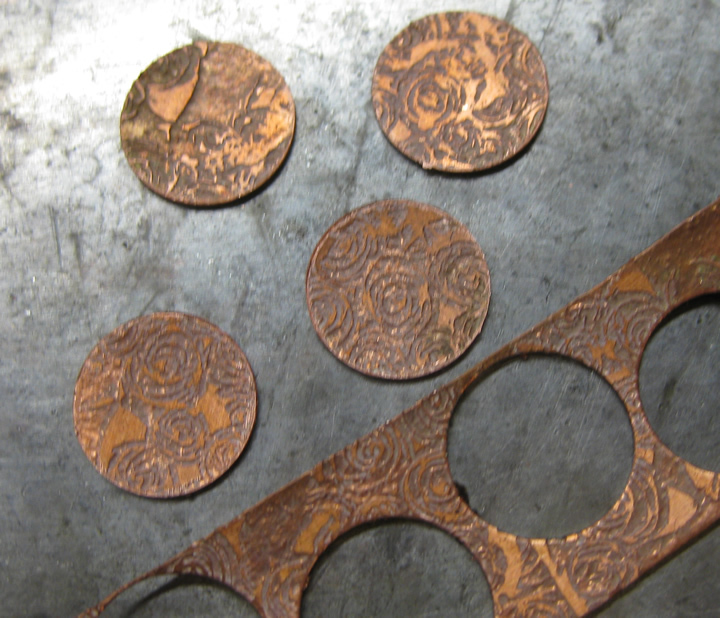 Sue etched a piece of copper, circles were cut out and Sue domed them then soldered on stud backs to make these…..
Fran textured one of these pieces of copper and used press forming to make a heart which she riveted with felt to make this …. 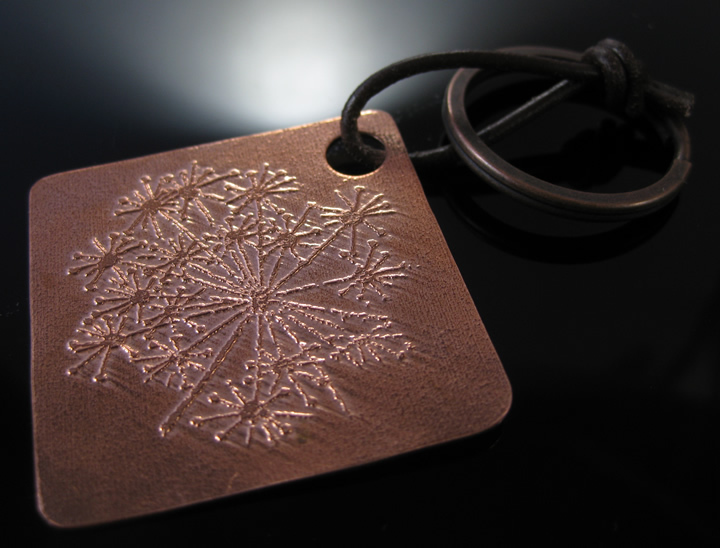 Sue made her etched design into a really nice key ring. Fran made hers into a lovely brooch, the liver of sulphur really brings out the detail of the etching. Brooch back with handmade pin. Do visit our FB page to see more of their lovely work and our website for more information about our jewellery making holidays. Day 20 – Free Day for Students – Lots and Lots and Lots of Ear Wires for Me ! Fran incorporated a fair trade bead onto her second bangle. Whereas I spent the day making lots and lots of lovely handmade silver ear wires and findings for our orders. Click on the photo to find out why so many people buy our beautiful findings ! We’ve been super busy with workshops recently and as always I am so impressed with the beautiful jewellery our students produce. Here are some of the group photos with links to the FaceBook album where you can see the photos individually. 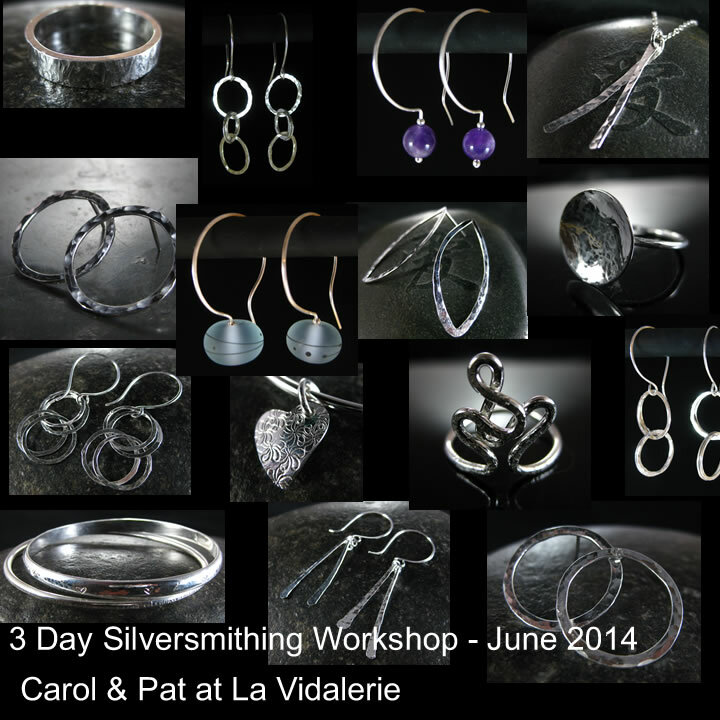 It was Shona’s first visit to La Vidalerie, she chose a one to one workshop incorporating a silversmithing taster, wire work and stringing. She made some gorgeous silver studs & stacker rings as well as learning how to make wire wrapped loops and stringing. And these lovely earrings Shona made with lampwork beads by Trudi at Glitteringprize (click on the image for Trudi’s Etsy shop). We had great fun with riveting, byzantine weave earrings, fold forming and sawing and a whole set of dangle rings. 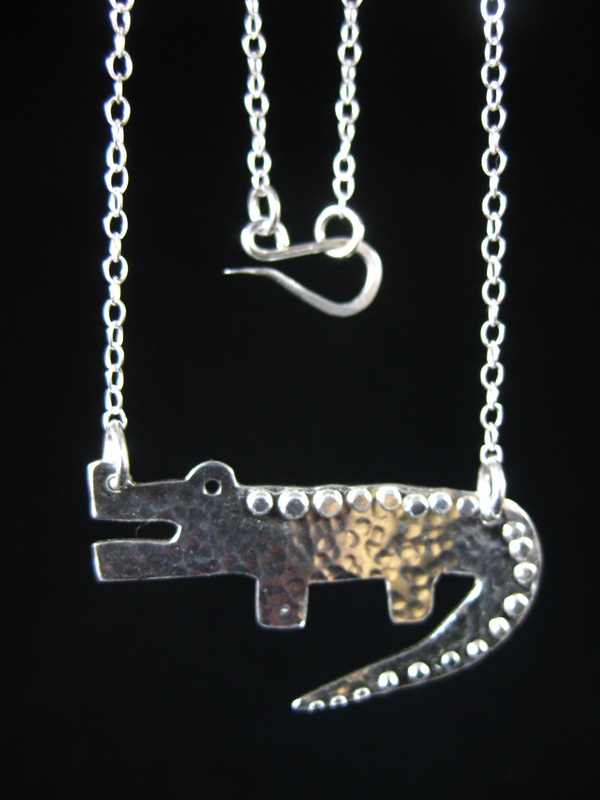 And this is Laura’s fabulous crocodile pendant – drawn then sawn from silver sheet, textured and riveted. It’s amazing how many techniques we used and the number of pieces they made – and we even had time to visit the night market at our local village St Geniez d’Olt and enjoy the fireworks (the night markets are run every other week in the season and the fireworks once or twice a year – both great fun and very French ! It was Jean’s 2nd visit to La Vidalerie and she had booked a 3 day workshop but by Friday decided that 3 days just wasn’t enough and extended her stay – we were really pleased to see her again and glad to have the extra time. 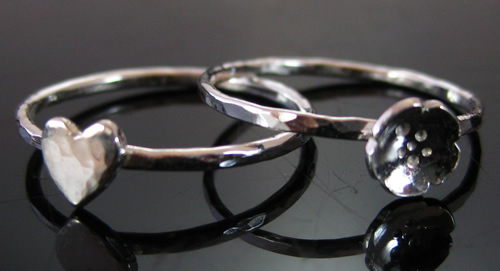 Joan wanted to expand her jewellery making to include stone setting and we all spent the week silversmithing, stone setting, fold forming, riveting, glass fusing and etching. 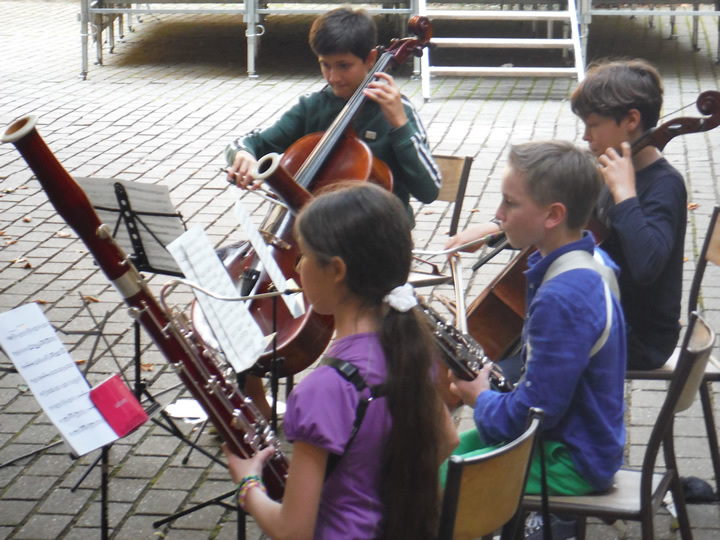 The music school was performing at the night market making the evening perfect. Toral came all the way from Jamaica via Canada for a week of jewellery making. She wanted to explore ways of using sea glass and to learn new jewellery making techniques. 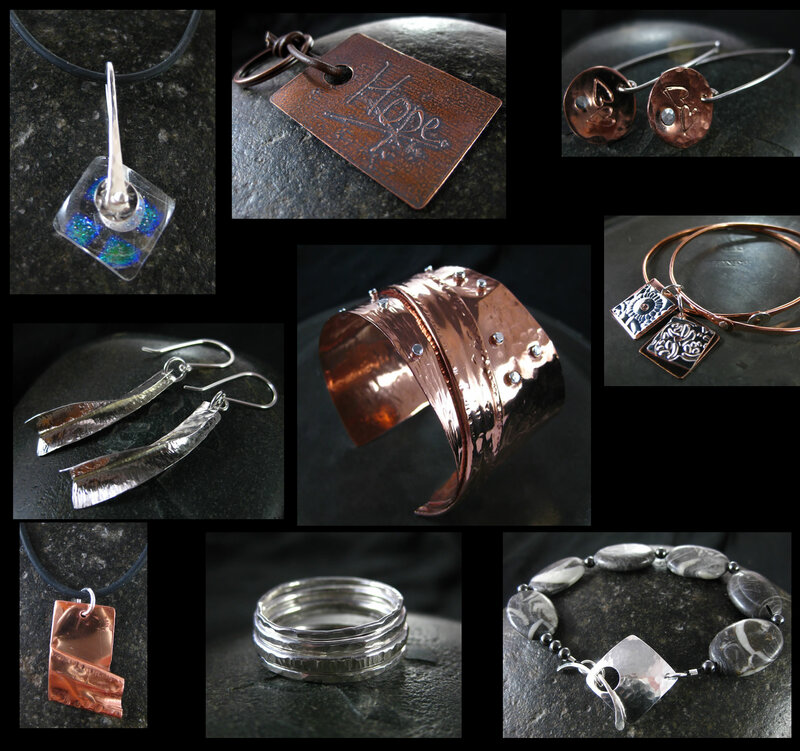 We had a great time with silversmithing, riveting, stringing and drilling glass and here are some of her wonderful creations. 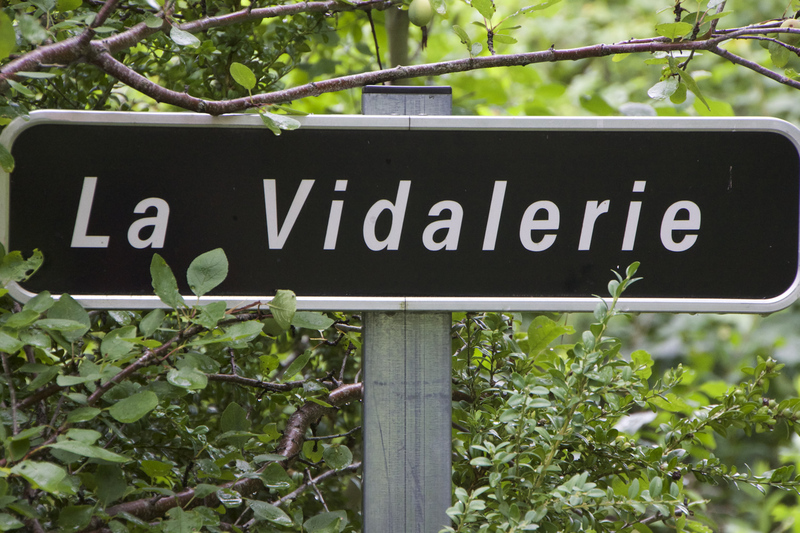 Toral came for the jewellery making but took some wonderful photos whilst she was here – La Vidalerie and the beautiful countryside around us – please click on the photo to see the rest of this album. 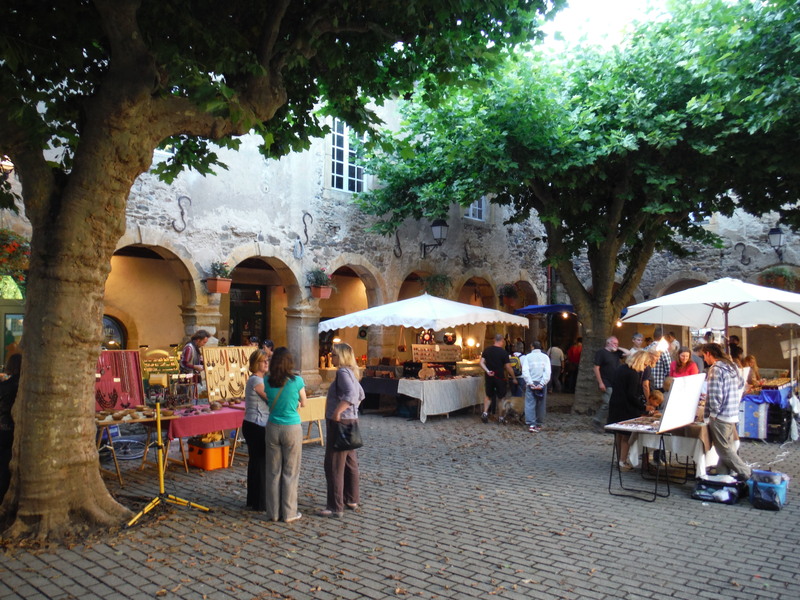 she reminded us why we came to the Aveyron – Thank you Toral ! 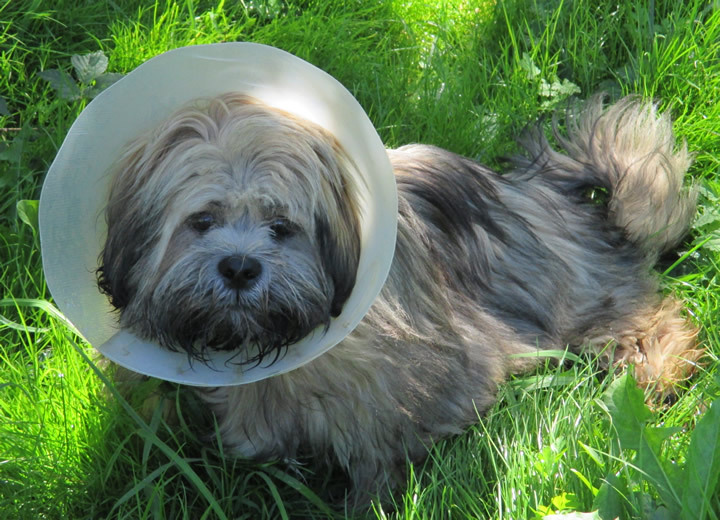 Poor Choo Choo, he’s walking around bumping into things at the moment due to the lampshade he’s having to wear following his little operation to stop him making more little Choo Choos – The good news is the lampshade comes off soon and in the meantime he isn’t letting it stop him running around the garden and enjoying his walks. We’re trying to convince him that all the best dogs are wearing them but I think the cats are making fun of him – darn ginges ! Lots of Jewellery Making Workshops & A New Puppy ! It was Chris & Annie’s 3rd visit to La Vidalerie and we had 2 wonderful days of fusing dichroic glass in the mornings and making it into jewellery in the afternoons – the photo shows some of the lovely things they made using riveting and traditional silversmithing stone setting techniques. We made bails from silver sheet and glued some of the pendants and earrings. We keep our class sizes very small to make sure everyone gets lots of 1 to 1 attention. Iseult and Paula had visited La Vidalerie before but Anne was a new student fitting in some jewellery making whilst on holiday from Australia. Fold Forming is a fascinating technique for adding texture and creating 3D forms from delicate to chunky (everyone made lovely delicate fold formed silver earrings and a chunky copper cuff). 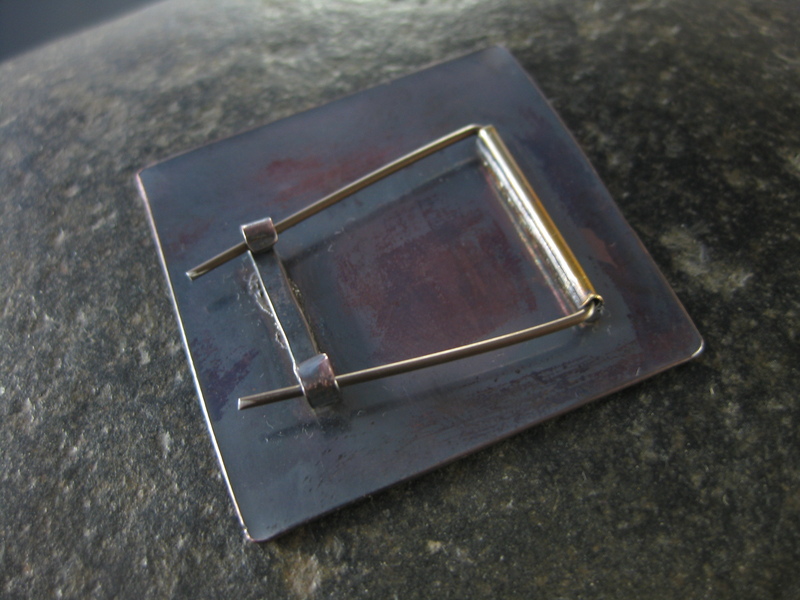 And as I’m sure you know – I love riveting – it’s great for joining metals (and things) together without worrying about solder bleeding and can be used purely decoratively. We of course managed to fit in some general jewellery making and some silversmithing. 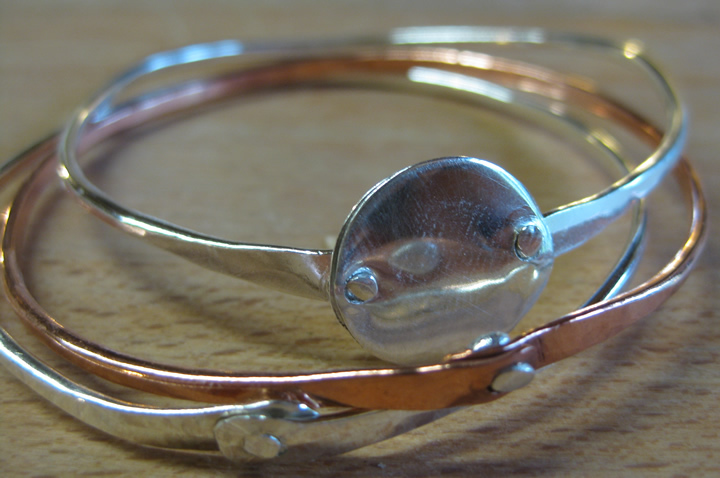 Anne – Lovely silver fold formed earrings & copper cuff, drawn then etched copper key rings & lovely riveted double wrapped bangle. 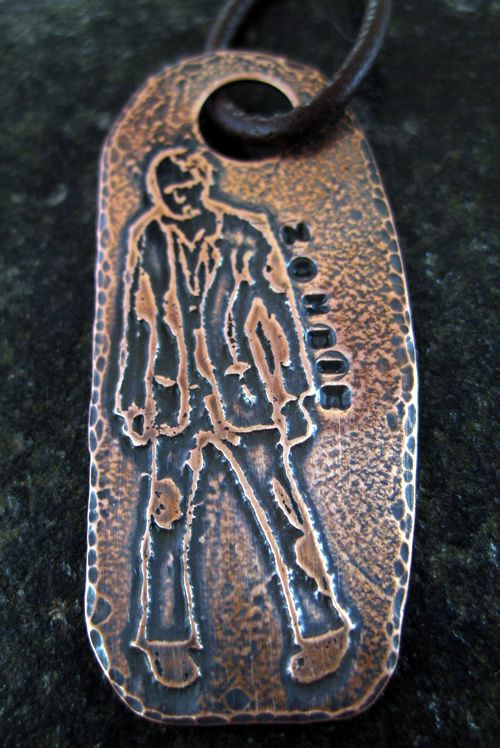 Oh – and everyone drew then etched a copper keyring – really great fun project. Carol & Pat booked a workshop holiday together with the aim of making a ring, bangle & earrings – as you can see they made much much more. We started with a simple soldering project making soldered rings for dangly earrings and moved onto silver studs, a pair of leaf shaped studs (to go with an existing bracelet), bangles, a ring with a domed and textured disk and more (the lovely stripey light blue lampwork beads are by Trudi at Glitteringprize). It was Jane & Wendy’s 2nd visit, they met by chance at a La Vidalerie Introduction to Silversmithing workshop last year and got on so well that they decided to book again this year and extend their skills into stone setting. 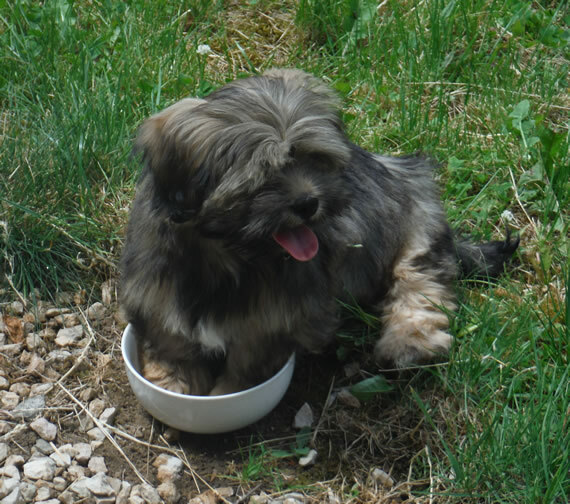 We’ve been planning to get a puppy for ages and finally Tim saw (and fell in love with) a little Lhassa Apso. He took me to see it and we couldn’t walk away. 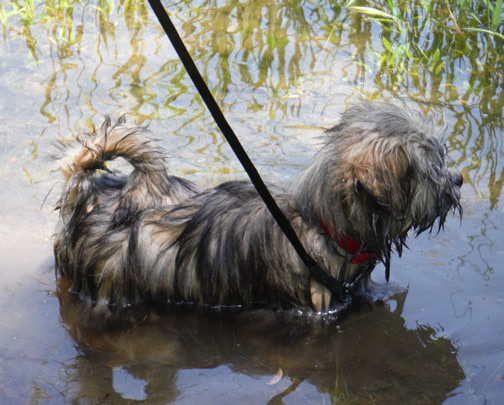 He’s called Choo Choo (long story) and is just so full of fun, inexhaustible, loves water and makes us laugh just looking at him. Days 14 – 17 and Another GiveAway or Two ! Well things just got away from me this week so I’m a little behind with my challenge. The last week’s workshop was a little hectic with lots of wonderful jewellery being made. One of the days workshops projects was wire rings, as well as making aluminium swirl rings and wrapped bead rings we planned and made a copper and bead ring ring based on an ancient design – this is the one I made. 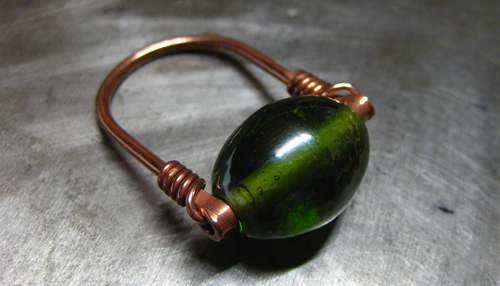 This is a fun ring to make, we used 1.6mm copper wire and a bead that was about the same width as your finger which was wired to the ring with 0.8mm wire. Don’t you just love olive coloured glass ? Aileen joined Evelyn and Rebecca for a noisy day of fold forming, riveting & wrapped sea glass pendants. Lots of hammering resulted in some fabulous silver & copper fold formed earrings and we made copper bangles with handmade silver rivets (the students made and added lots of stamped copper charms to theirs). I have these in copper and bronze for sale on my website – just click on the photo above. We finished the day with wire wrapped sea glass pendants – you can see one of these in the composite picture at the top of today’s post. Today was the day we said goodbye to Evelyn and Rebecca and took them into Rodez for their connections. Rebecca’s flight was in the afternoon giving us chance to visit the bead shop, I bought some ceramic beads and made this when I got home. I took a large ceramic flower bead, tied a large knot in a lovely deep pink silk thong and threaded the thong through the flower then knotted these lovely pink and white beads to the ends of the silk. I made some silver balled end head pins and made some Swarovski bicone dangles which I put onto silver jump rings and knotted in place onto the silk to add a bit of sparkle. You just wrap the silk around your wrist and either tie or tuck the ends in – lovely colours just in time for summer ! GIVEAWAY DRAW – Just add a comment to this post to be included in the draw – make sure you put “wrap” at the beginning of your comment so I know which draw you are entering. Today’s make was a quickie, a message from one of our students reminded me that I had some 0.8mm sterling silver beaded wire (this is silver wire that looks like it has lots of round beads threaded on to it but is actually solid wire). As you may know ear wires should be made out of 0.8 wire and I wondered if this beaded wire might make some interesting hoops – and here they are. These are tiny hoops, about 1.5cm across, I just made a small loop at one end of the wire, rubbed down the other end (so it doesn’t scratch your ear) and made a small bend then roughly made the wire into a circle and slipped then bend into the loop and pulled the hoop over my ring stick and gently hammered (whilst avoiding the loop and bend) to make the hoops harder. 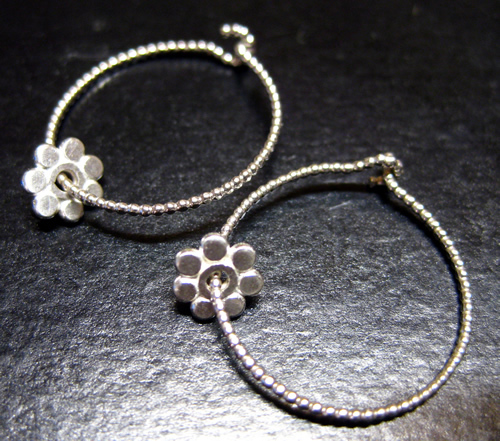 The daisies are made from little silver spacers (sometimes called snowflake spacers) which I hammered a little flatter and suddenly they looked like daisies. The hoops are a little soft (after all the beaded wire is less than 0.8 between the “beads”) but very cute. GIVEAWAY DRAW – If you would like to win a pair just add your comment to the bottom of this post – make sure you put “hoop” at the beginning of your comment so I know which draw you are entering (please feel free to enter both). Jo & Mel went home yesterday after 3 really fun workshop days. They came full of ideas and enthusiasm – the only things you need to bring to our workshops. Jo & Mel’s Wonderful Creations ! You’ll find more photos of their work on our FaceBook page – (Just click on the photo above) but here are just a few of their pieces for you to enjoy ! 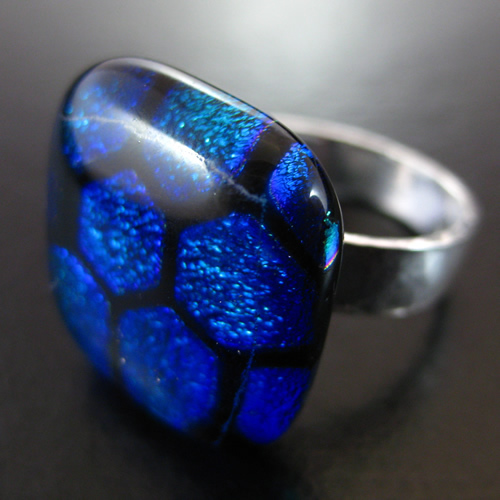 They both had a go at glass fusing, Jo cut and fused dichroic glass to make this cab then made the ring mount in sterling silver. 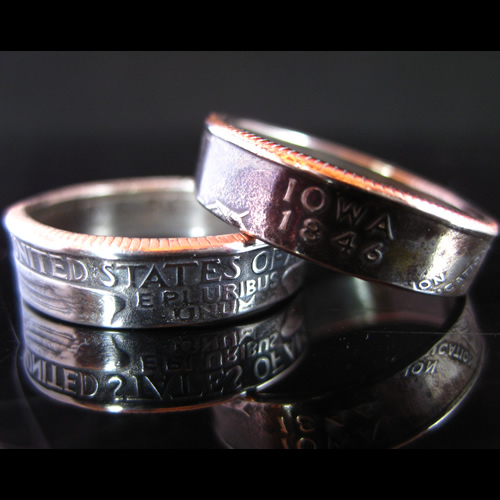 Jo wanted to make a set of stacker rings for her daughter, she made 5 silver rings and here are just a couple of them. 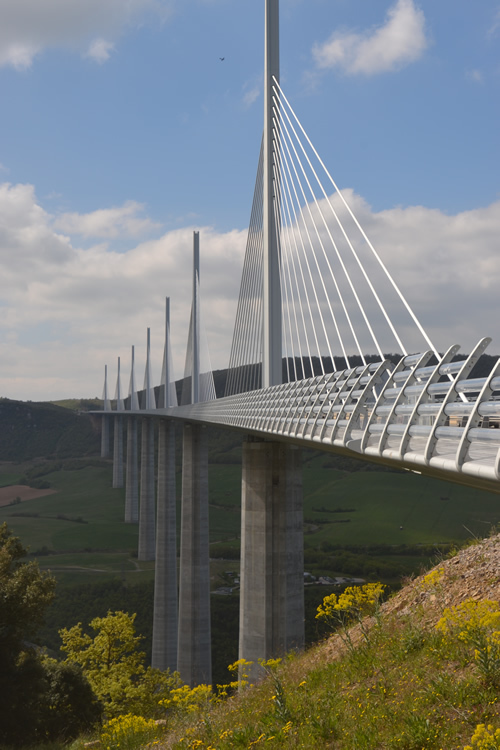 You’ll find more information about La Couvertoirade by clicking on the photo and visiting their web site. Jo and Mel left us very happy with their work and full of even more ideas for their next visit ! 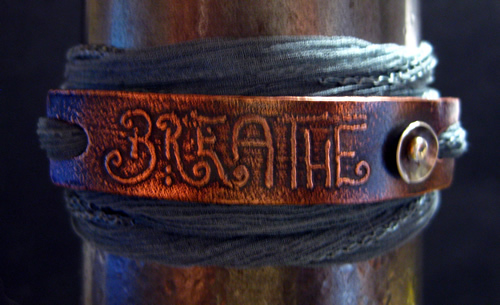 Yesterday I made another etched copper wrap bracelet, this time BREATHE with a riveted silver flower. 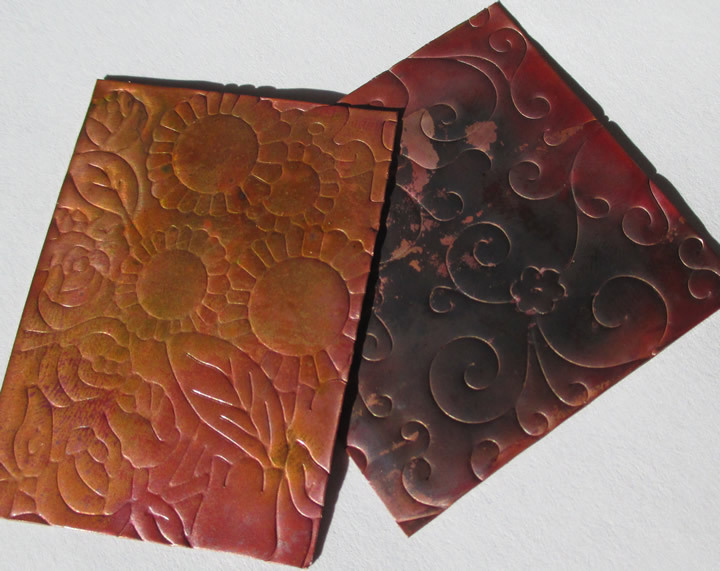 Etching is a wonderful technique, you can learn more about etching and riveting on one of our jewellery making workshop holidays and make your own etched copper jewellery. Follow my blog and you’ll be emailed each time I make a new posting. Latest Workshops and the Hares are Back ! As you may have noticed blogging doesn’t come naturally to me, I have great plans of posting photos of the processes of making jewellery but get too excited whilst making things to remember to take the photos and find myself half way down to the village before I remember my camera. Thank heavens for Tim and his workshop photos ! Lesley had been collecting semi-precious stones on her travels for years and was looking for ways to use the larger pieces and those without holes. We started off with silversmithing basics and she made a lovely pair of simple silver earrings – 3 soldered rings, hammered and hanging together from handmade ear wires, this was followed by wire wrapped hematite earrings, more ear wire, a variety of handmade findings, a very striking copper bail for a large semi-precious pendant, lovely long flower earrings and a bezel set rose quartz cab in a handmade silver pendant and lots more – not a bad haul for 4 days ? You can see the pieces in more detail by clicking on the photo above. Kit had 3 days with us and due to her busy life wanted to investigate techniques that could expand her jewellery making skills but without taking too much time to complete. I know how frustrating it is when you can’t commit the time to a large project and you seem to be working on the same thing forever. Here are some of the beautiful things she made. Lovely dangly herringbone wrap silver earrings, soldered triple ring hammered earrings, lots of styles of ear wire (an important basic for making beautiful earrings) hammered domed squares, very sweet flower studs, filed from silver sheet then domed and soldered to silver posts, a lovely sawn, stamped and domed silver heart pendant and her favourites – tiny cascading cup earrings ! Please click on the photo to see more detailed images. Tim was up on the road one day just looking up at the power line when he though that one of our neighbours dogs had come and sat by him. Eventually he looked down into the enormous amber eyes of a huge hare just sitting down beside him and looking up into the sky to see what Tim was looking at. After a few minutes the hare got up and made his way down the road – Now that must be a once in a life time experience ! Coming soon – Salt Water Etching !